When Grandma Rosa lost her hearing, Sandra and her parents became frustrated and sad. They didn’t know what to do and how to learn to communicate better with Grandma Rosa. They tried shouting, changing the tone of their voices or leaning closer to her ear when they talked, to no avail. Rosa could hear some sounds clearly, but certain sounds she couldn’t hear well. It became an everyday struggle for the family, and they missed the comforting family conversations at dinner time. 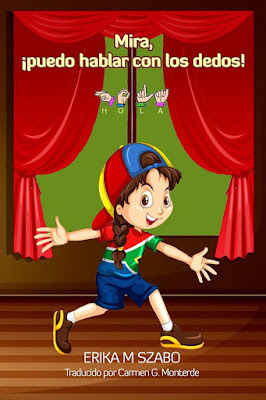 Sandra finds a website for hearing impaired people that explains how deaf people communicate. They start learning sign language and to “talk” with their fingers. Sandra and Grandma Rosa find realize that with compassion, love, and hard work, they can overcome the obstacles of disability. This fun picture book carries an important message to children, how to learn not to judge or make fun of anyone just because they’re different. The life of any disabled person is no fun and living with a disability has many challenges, but we can help to make their life easier and not harder. Not only a cute story, but a very important one, too. This is lovely, Erika! So glad you've translated it to Spanish. It is a most needed concept in our children today...to not judge on differences, but to embrace them. Great covers Erika, just perfect for kids. Such a great way to introduce children to sign language and a second language! 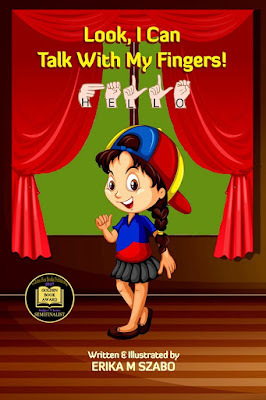 Sunday's blog on A Small Gang of Authors is a fine excerpt in both English and Spanish from Erika M. Szabo​'s wonderful and education children's book, Look, I Can Talk with My Fingers. Check it out, please. Thank you!